SO! This kit. 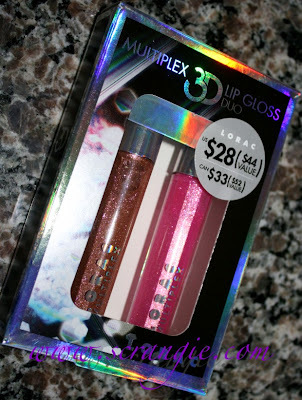 It has two full sized Multiplex 3-D Lipglosses. 3-D and 4-D. 4-D is exclusive to this set. It costs $28, which really is a good deal because the Multiplex glosses cost $22 individually. 4-D on the top, 3-D on the bottom. They have clear acrylic wands with tiny tiny white brush applicators. 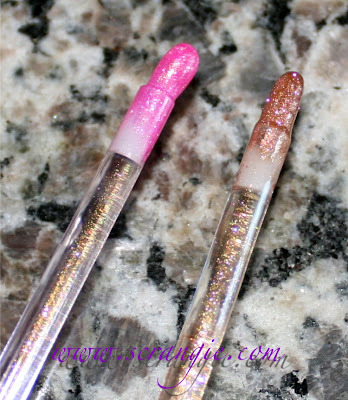 Those wands look so pretty covered in the sparkles from the gloss. Sometimes I take out the wand just to look at it. 4-D on the left, 3-D on the right, without flash and with flash. 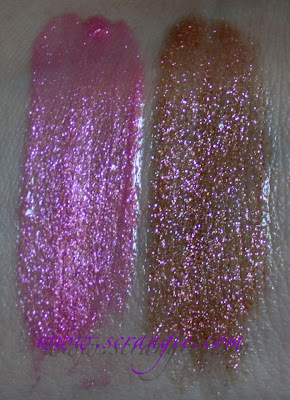 4-D is a bubblegum pink with tons of glass-fleck-ish silver based sparkle. 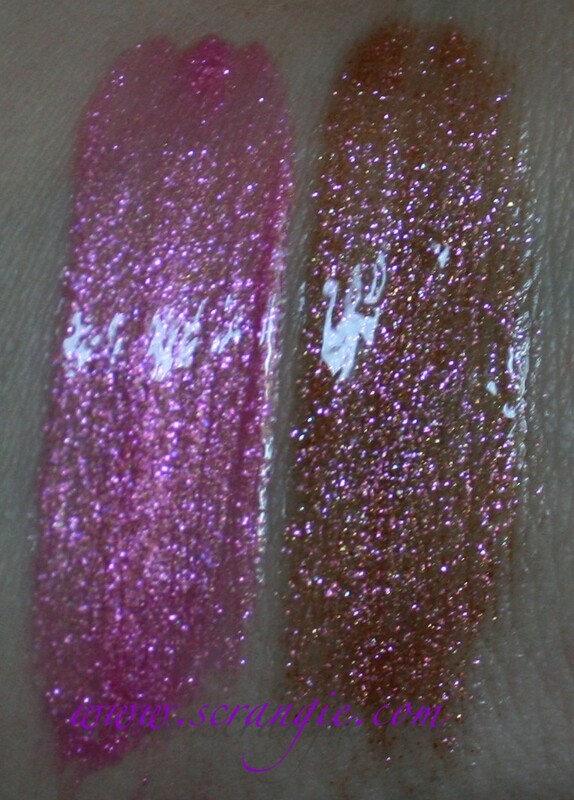 It looks a little frosty on the lips because there's so much silvery-pink sparkle. 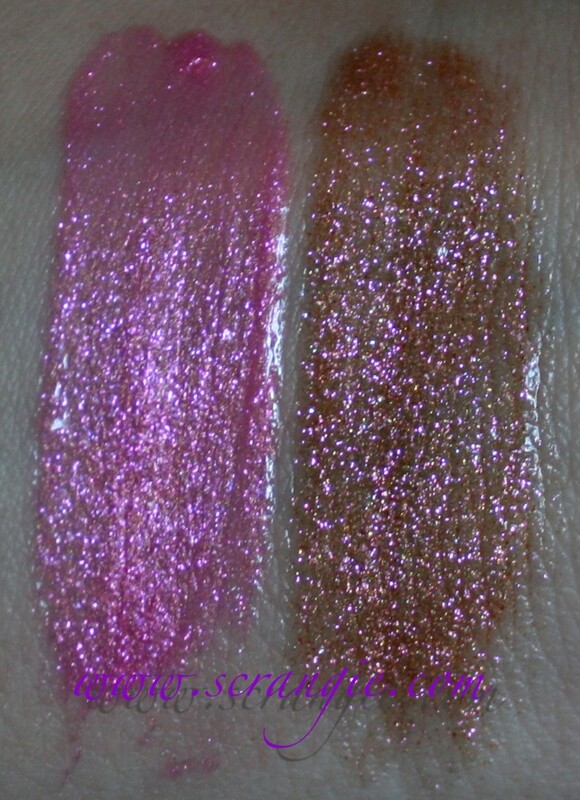 Not much duochrome to it, just lighter and darker shades of pink. 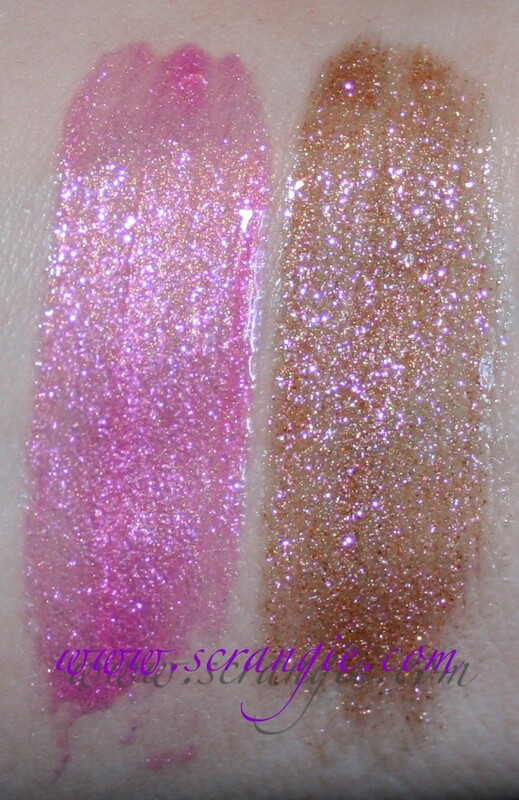 3-D is a bronzy sheer base with gold/green flash and tons of iridescent pink, rose-gold, bronze and greenish glass fleck sparkle. 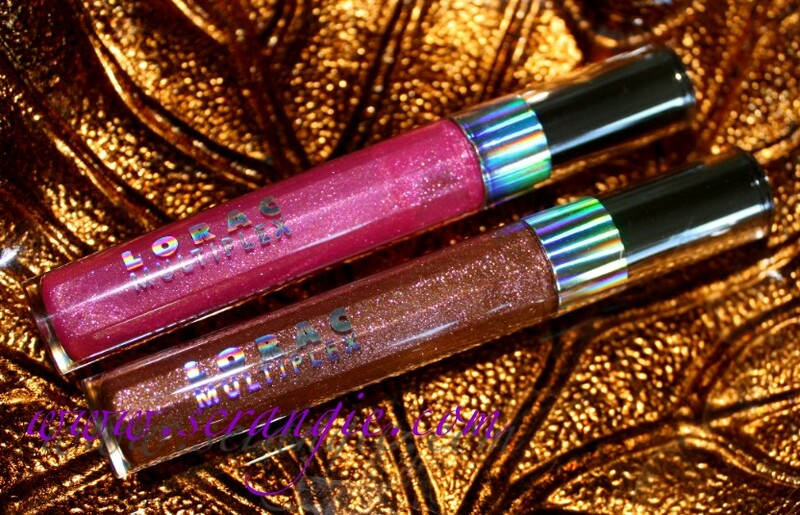 The formula on these is different from the first Multiplex shades I bought (right when they first came out). The original formula is thin and slippery, these are thick and sticky. It seems like they altered the formula to make it more long-lasting, but I preferred the light, non-sticky original formula, even if it didn't last as long as these do. Luckily the scent is the same. I love the scent of these. It's light and sweet, possibly a peach or lychee scent with a smoothness to it like a bit of creamy vanilla? I can't really pin down what the exact scent of these it, but it's a non-sour light fruity scent with a little creaminess to it. Very pleasant. A slight sweet taste as well. The new formula wears a lot longer than the old one, but now the gloss is sticky. I want the old formula back. I don't mind re-applying! I already loved 3D, but I'm not sure if I really like 4D. It's a nice shade of pink, but it looks a little too silvery-frosty on me. I haven't worn it much. Not a fan of frosty lips. And I know it's not a frost, if anything it's a glitter, but the light pink pearls reflect so much that it has that silvered-frosty finish in indoor lighting. This set is limited edition and it was gone from both Ulta and Sephora's websites last time I checked. I did see it in store at both as recently as two weeks ago. I am unclear on whether or not 4D will ever be sold solo, and as far as I know it's exclusive to this set. 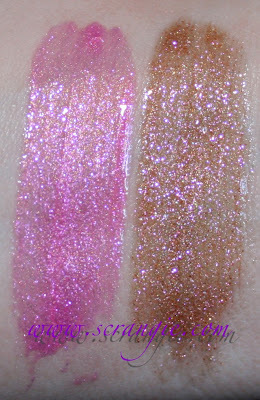 These are both really pretty, but of the two, I prefer 3-D. These are so pretty. Sticky, no!